Embedded systems are ubiquitous. In the near future, an ever-increasing number of them will be able to interact with other systems by means of wired and wireless communication. In addition, they will be able to perceive and manipulate the state of the physical world by means of sensors and actuators. Together these networked embedded systems provide the technical basis for calm systems that are mostly invisible and intuitive applications that support a broad spectrum of everyday tasks. From a developer’s perspective, such networked embedded systems significantly complicate many phases of the systems’ lifecycle. Instead of being built for a particular purpose that can be specified completely at design time, networked embedded systems have to be open to support the continuous evolution after their deployment. Furthermore, they have to be engineered specifically to cope with uncertainties resulting from imprecise measurements gathered by low-cost sensors or dynamics induced by mobility and unreliable communication. This requires the extension of existing and the design of novel concepts to simplify their development and utilization. 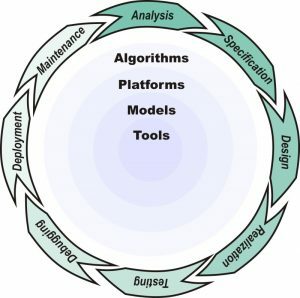 To ease the development and utilization of networked embedded systems, the Networked Embedded Systems group focuses its research on the design and development of novel algorithms, platforms, models, and tools to support the whole lifecycle. At the present time, the research is centered on the early phases such as analysis and design as well as on the later phases such as testing, debugging and deployment. An overview of past and present projects can be found on the projects page. An overview of recent results can be found on the publications page.